Checking and adjusting the valve clearance is a very necessary task that must be periodically performed on your Honda CB125E to ensure that it continues to perform reliably and at its best. If the valve clearances are too wide then the engine will develop a noisy tapping sound over time and the valve train will wear prematurely. If the clearance is too tight then the valve may remain slightly open during the power stroke and cause the engine to lose power. It will also burn out the valve fairly quickly. This is a more advanced task so make sure you read these instructions and also perhaps the relevant section in the owners manual from beginning to end first if this is your first time adjusting valve clearances. Proceed if you feel confident. Honda recommends that the valve clearances are checked and adjusted if necessary at the initial service (1000km or 600 miles) then every 4000km (2500 miles) after that. I usually pick shorter intervals than manufacturers but in this instance I feel that there is no benefit in checking them earlier. You will most likely find that you are checking the valve clearances but not adjusting them every time they are checked. About half of the CB125E owners Ive spoken to have said that the valve clearances required slight adjustment at the initial service. Mine were checked at the appropriate intervals but did not require adjustment until 12 000km (7500 miles) and even then they were only out by 0.001in. Valve clearances should only be checked when the engine is completely cold as the clearance changes when the engine temperature rises. Leaving the motorcycle to cool off overnight is highly recommended. Start by removing the crankshaft hole cap and the timing hole cap located on the left hand side of the crankcase (pictured with allen keys in the caps). Removing the crankshaft hole cap allows you to rotate the engine by putting a socket directly onto the bolt securing the flywheel. Removing the timing hole cap allows you to align the timing marks so that the engine is at top dead centre of the compression stroke, necessary to ensure that neither valve is open. Removing the spark plug cap will save you getting in a tangle. It should simply slide off the top of the spark plug with a zipping sound. Tuck it into the frame out of the way somewhere. Now we must remove the rocker cover (alternately called a cylinder head cover). Remove the two bolts holding the pipe onto the rocker cover, carefully remove the pipe making sure you dont damage the O-ring and tuck it to one side. Remove the rocker cover bolts making sure you dont lose or damage the seals underneath them and put them to one side keeping them as clean as possible. The rocker cover can now be removed. As it sits on locating dowels it must be lifted straight up and may require gently wiggling to loosen it off. Make sure you dont damage the rubber gasket between the cylinder head and the rocker cover. Avoid the temptation to pry the rocker cover off with a screwdriver or other lever as this may do damage. Once removed place the rocker cover in a clean safe location top down. Inspect the rubber gasket before storing it with the rocker cover. If it is broken, squashed flat or otherwise damaged it should be replaced. It could be re-usable a few times but consider keeping a replacement handy for the day when it is not. Now we must make sure that none of the valves are open. The best way to do this is to rotate the crankshaft counter-clockwise (the normal direction of the engines rotation when it is running) with a socket on the end of the flywheel retaining bolt (accessed through the crankshaft hole cap). Look through the timing hole cap and you will see a timing index marked with a T come into view, the timing index should line up with the notch on the top of the timing hole (see picture). Be careful to get the T index as there are other indexes such as the firing index (F) in there just to confuse you. With the T index aligned to the notch on the crankcase the engine is at top dead centre but it may be either on the compression stroke or the exhaust stroke. The valve clearances must be checked when the engine is on the compression stroke as both valves will be completely closed. 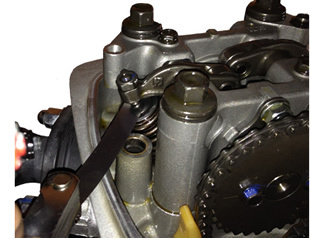 To check that it is indeed on the compression stroke try and move the rocker arms, if they are free and move slightly then the engine is on the compression stroke. If they wont budge then the engine is likely to be on the exhaust stroke. If this is the case rotate the engine counter-clockwise a full 360° and line up the T index to the notch once again. The valves should now be free. On my Honda the keyway on the camshaft sprocket is at the top and pointing up when the engine is at TDC on the compression stroke. It is likely that all CB125E's are the same in this regard. Check the valve clearance by inserting a feeler guage between the valve stem and the adjusting screw. The picture at the top of this page shows the exhaust valve being checked and the picture in the step by step montage shows the inlet valve being checked. The intake valve clearance should be 0.08mm (0.003 in) and the exhaust valve clearance should be 0.12mm (0.005 in). There should be a slight resistance as you slide the feeler guage between the adjusting screw and the top of the valve stem. If there is no resistance the clearance is too large. If you cant get the feeler guage in to measure then the gap has closed off and the clearance is too tight. In both instances the valve clearance requires adjustment. If adjustment is required loosen off the locking nut on the adjusting screw (pictured) and turn the adjusting screw to change the clearance. Turning the screw clockwise will make the clearance smaller and turning it anticlockwise will increase it. Measure the clearance as you turn the adjusting screw, you should feel some resistance when the clearance is correct. The adjusting screw does not need to be turned very far, for example my valve clearances require adjusting about 0.001 in which was barely 1/8 of a turn of the adjusting screw. Once you are satisfied that the clearance is correct tighten the adjusting screw lock nut to 14Nm (10lbf-ft) and then recheck the clearance to make sure that tighten the lock nut has not altered the clearance. If it has loosen the lock nut and adjust the clearance again, once again rechecking it after you have tightened the lock nut. If you are way too thorough like I am consider rotating the engine two full revolutions and bringing it back to top dead centre on the compression stroke and then giving the valve clearances one final check. Reinstalling everything is basically done in the reverse order of removal, taking care to inspect all O-rings and the rocker cover gasket to ensure that they are servicable. Make sure that all parts go back onto the motor clean as a few specks of dirt in the wrong place can be very bad for your engine.